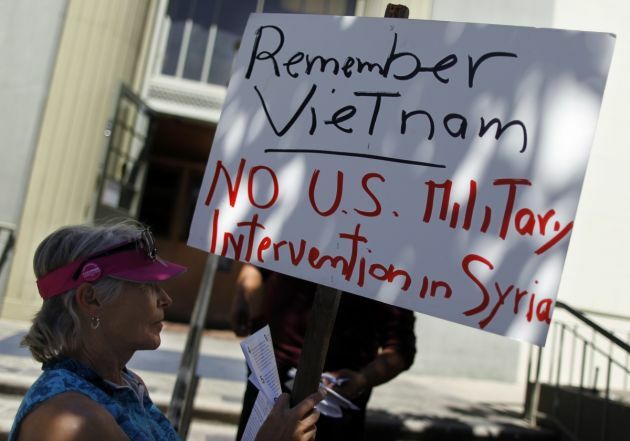 (Photo: REUTERS / Michael Fiala)Lynn Hamilton attends a demonstration organized by the Peace Coalition of Monterey County to protest against possible U.S. military intervention in Syria, outside the offices of U.S. Rep. Sam Farr (D-CA) in Salinas, California, September 4, 2013. The World Council of Churches head has told the United Nations Security Council that an attack on Syria threatens every community in the nation including Christians, and that the key world powers need to talk. "Particularly we encourage the leaders of the USA and of Russia to use the time as they meet in the coming days to agree on their contributions to a political process towards peace and justice for Syria," said Rev. Olav Fykse Tveit, general secretary of the WCC on Wednesday. His call came as U.S. President Barack Obama was on his way to St. Petersburg to take part in a meeting of the G20 leading economic nations hosted by his counterpart Russian President Vladimir Putin. The U.S. Senate's foreign relations committee approved a resolution on Wednesday authorising limited military intervention in Syria, setting the stage for a contentious debate in the full Senate next week on the use of force, Reuters news agency reported. Obama see military action in response to a chemical attack in Syria last month as a moral responsbility while Putin says an armed strike would be an act of aggression. In a letter sent to the Security Council on September 4, Tveit condemned all use of chemical weapons in Syria, saying, "We must do everything possible to starve the fire of war rather than feeding it with further deadly armaments." In his letter Tveit joined the call of Pope Francis for prayers for peace in Syria, to be observed by all faiths September 7. "The crime of using chemical weapons is to be thoroughly investigated and prosecuted. "However, an attack from outside Syria is likely to increase suffering and the risk of more sectarian violence, threatening every community in the nation including Christians," Tveit said. He noted, "An attack from outside Syria is likely to increase suffering and the risk of more sectarian violence, threatening every community in the nation including Christians. "At this crucial time, the people of Syria and the Middle East need peace and not war." Tveit said that neither weapons nor military actions could bring about peace in Syria. There is no other way to sustainable justice and peace Syria's people than hard work from all the parties inside and outside Syria "to find a negotiated political solution."